Club Penguin Cheats by Mimo777 Club Penguin Cheats by Mimo777: Club Penguin Sneak Peek: The Fair! 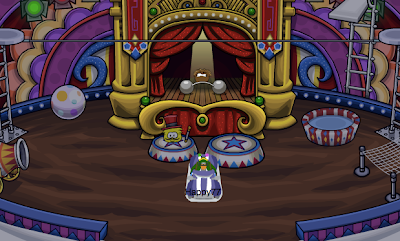 The Club Penguin Fair is coming up sooo soon! So check out below for some cool new things! What are you looking forward to most about The Fair!? Hey, Mimo. Just wanted to visit for old times in Club Penguin. to this new ticketing system. I have very exciting news! Rookie was online today about 1 or 2 hours ago. He was on the server Belly Slide. I met him in the Snow Forts. He stayed i the room for like, 5 to 10 seconds. Hardly a minute! It was amazing! I wish I could show you the picture. Keep on keeping on! And I will be most excited for everything! I've been in this party twice with several different accounts. And what's awesome is that the tickets we get won't go away when we log off! Awesome! See ya! I'm pretty sure that you joined CP after 2010. Back in 2006- 2007 there were absolutely no member rooms, no quests and no giant dragons, robots and volcanos. Parties were about partying, not destroying evil creatures and solving mysteries. It seems to me that CP has lost its touch. I think they try to make CP an action-kinda game, to make it more interesting, but it doesn't work at all. Disney just milks CP in order to make money. First, they had a MARVEL party to promote the comics. Then, here comes the "Music Jam" (had nothing to do with the music jam though) which promoted a Disney TV show. Then, the Adventure party, which once again had nothing to do with the previous parties, promoted some smoothies.What are they planning to do next? I guess the Fair will promote a circus or something, the ninja party will promote a martial arts school and the holidays party will promote "Disney on Ice". Also, is it necessary to have a "famous" penguin in every single party? Am I the only one who is getting annoyed by that Rookie? He was funny in the missions, but now he is just plain annoying! Whew, that was a long post. Well, that's all. Thanks for reading (if you did). Mimo, if the CP staff reads your blog, I'd be glad if they saw my comment. I'm excited for EVERYTHING! :D I'm glad there's no member room this time! Club Penguin is finally doing stuff for all penguins!